One-piece wonders are our new go-to everything. Jumpsuits are back and we are getting out our party hats because what could be better than “one and done?” No more “which blouse works with that knife-pleated skirt or what sweater is the right length for those high-waist trousers etc.,” because a one-piece jumpsuit makes all those niggling little fashion conundrums disappear. Every few decades or so these little one-piece wonders creep back in to our zeitgeist–sometimes it is a quick visit and other times they stick around a while. This latest climb to immortality began making a slow but steady climb a few years ago, but this spring, jumpsuits are going to be hotter than black asphalt on a summer day in Mississippi. There is no denying that jumpsuits are the perfect mix of chic and cute and even though cute isn’t our usual beat, the chic factor is undeniable and that works for us. Plus jumpsuits make us happy, like jumping for joy, but in a fashionable way. 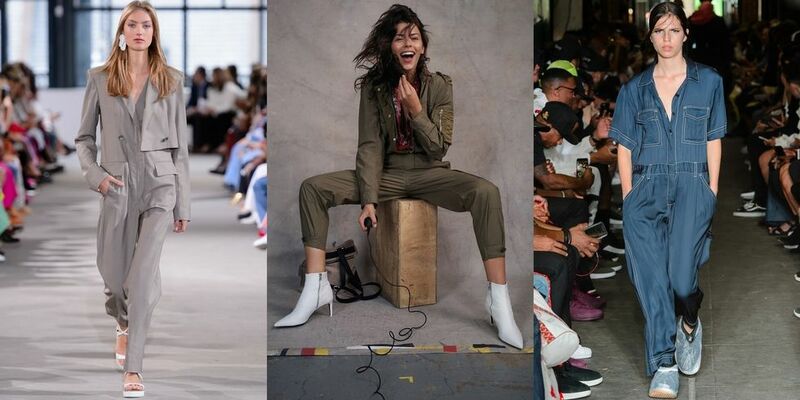 The military look jumpsuit in shades of khaki is where we are headed for everyday “I’m the boss-lady” wear but we are equally in love with the feminine flowered look. A red jumpsuit for evening is so much more interesting than those LBD go-tos in our closets, so why not stretch our legs without having to worry about what goes on your top and the bottom? Don’t let anyone tell you that jumpsuits are for kids and if that happens, send us their names because we are keeping a list. There is really only one reason we can think of that might discourage you from wearing a jumpsuit, but you really shouldn’t be drinking 8 cups of coffee anyway!